This page shows how to create a “commercial” rent roll. 1. Start with required fields (marked with *). Enter as much or little information as you like. You can always return to this entry. 3. After you click the Update button, the tenant list will be enabled. Quick Add – Easy way to add basic information for five tenants at a time. Bulk import – Quick way to add shared information for many tenants at a time. Add individual tenant – Add detailed information for one tenant at a time. In the rent roll page’s tenant list module, click the Quick Add button. Enter information for your tenant(s) then click the Update button. You can add up to five tenants at a time. If you need to add more, you can either click Update, then return to this screen, or you can click the Open Bulk Import Window button next to the Update button. First reach the Quick Add page. See above. On the Quick Add page, click the Open Bulk Import Window button (next to the Update button in the above screen shot). 1. 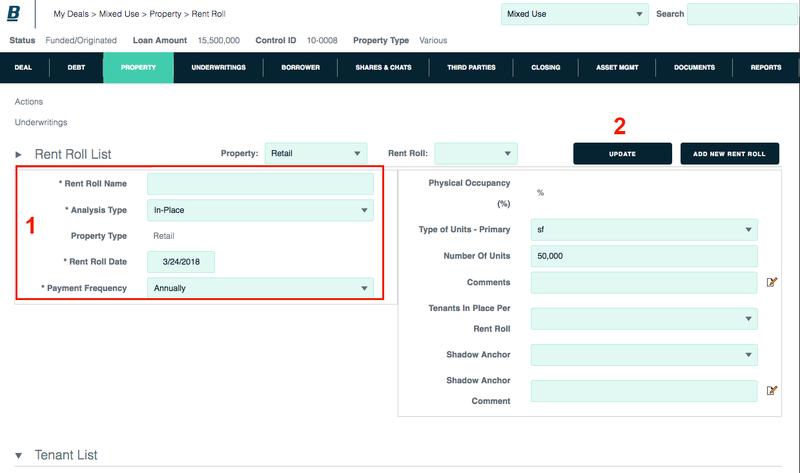 Set the common unit status, tenant type and unit type for all tenants you are about to import. 2. Enter each value on its own line. If two values are on the same line, the second item will be ignored. To enter content from Excel, select the column header, select copy, then paste the column into the appropriate box. Make sure all rows lines up with each other. Note: Tenant name, contract rent and unit status (menu next to #1 above) are required. 3. When you have entered all shared tenant information, click the Update button. You can enter unique tenant information — or edit the tenant listings — later. 1. Start with the required fields: tenant name and contract rent amount. 2. Enter as much information as you like, then click the Update button. You can always add to or edit this tenant. 3. If you want to add another tenant the same way, click the Add New button.